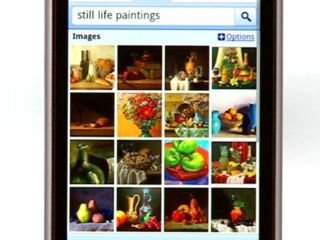 Google has announced a new image search web application for the iPhone and Android mobiles. Basically, it's designed to make looking for the image you want that little bit easier, and improving the viewing speed and quality too – although only on handsets with iPhone 3.0+ or Android 2.1. For instance, when viewed on these phones, the thumbnails are now square so you can squeeze more onto a page. You can also swipe left and right through the pages, making it much easier to go to the next set of pics than having to locate a tiny hyperlink. When tapping to make them full size, a black background helps 'emphasise' the image, according to Google, and you can also browse the images using swiping. This service is available from www.google.com from your Android phone or iPhone, where you simply tap 'Images'. Google also states that this is available in 38 languages, and says "whether you like to look through pictures of prom dresses, impressionist paintings or 猫　ジャンプ we hope you love this update to Image Search for mobile."